Today I visited the Pergamon Museum here in Berlin. 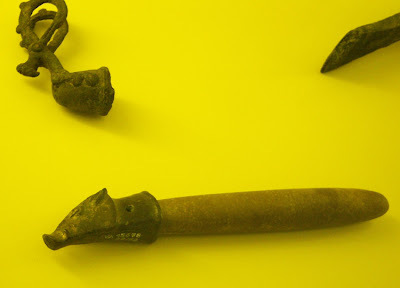 Of course, I scanned all the exhibits searching for pig motifs, and I indeed found a few. I apologise for the bad quality of some (most) of the photos. Bad lighting conditions, no flash, handheld camera, crappy white balance, and all that. 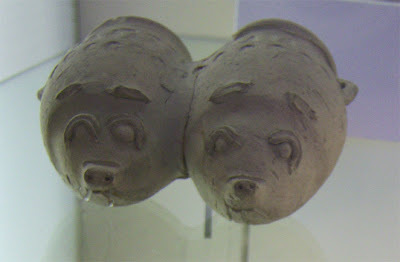 Above: Double vessel in the form of two little pigs, Assyria, 8th/7th century BCE. 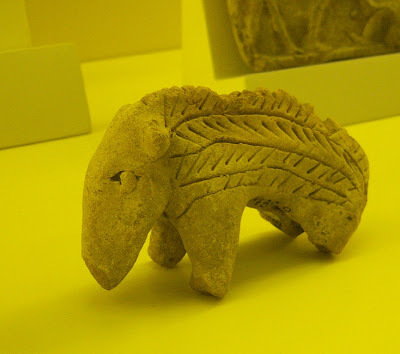 They are likely to be domestic pigs, which makes them quite interesting - pigs didn't seem to be all that common in Assyrian arts and crafts. And is there some particular meaning behind the double shape? 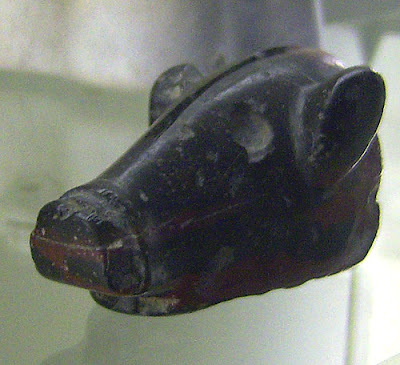 Above and below: Boar's head, Babylon, 1st century BCE/year 12 of Nebukadnezar II. It's hard to tell what exact meaning the boar might have in this case. 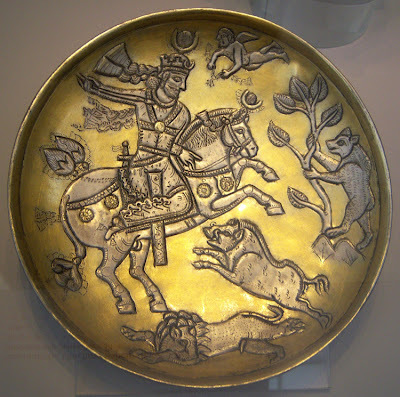 Below: This piece was described only collectively as one of a number of "riders and animal figures", but it can hardly be anything but a boar. 2nd-1st century BCE, Babylon. The hairiness of the pig suggests that it's likely to be a wild boar. 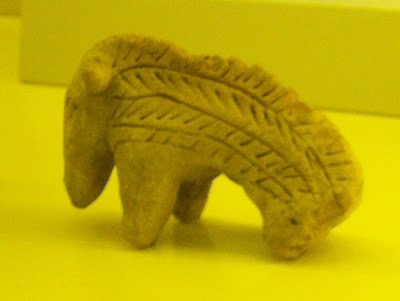 Below: An object from Luristan, a province in western Iran inhabited by nomadic tribes. These objects are usually offerings from graves. Somewhere between 8th/7th - mid-3rd century BCE. I'm not sure about its function. 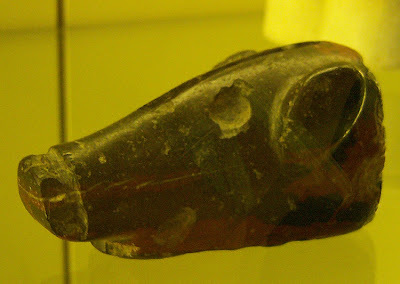 The similar piece with a deer above it and the nomadic culture of its makers suggest a hunting theme. 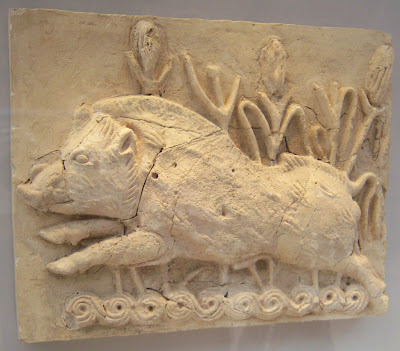 Below: A wall relief plate with a jumping boar, Iraq (Ktesiphon area), 7th-6th century. 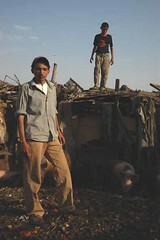 From the intrados of a house in Umm az-Za'âtir. I'm guessing this piece is related to hunting, as well. 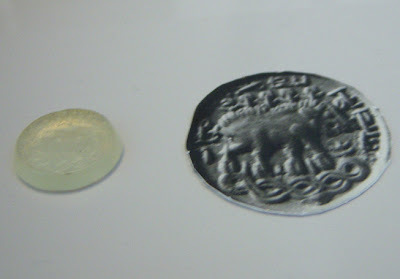 Below: A seal stone (to the left) with a wild boar and Pahlavi inscription, Iran, 5th-6th century. To the right is an enlarged image of its impression. I wish I knew what the incription says.